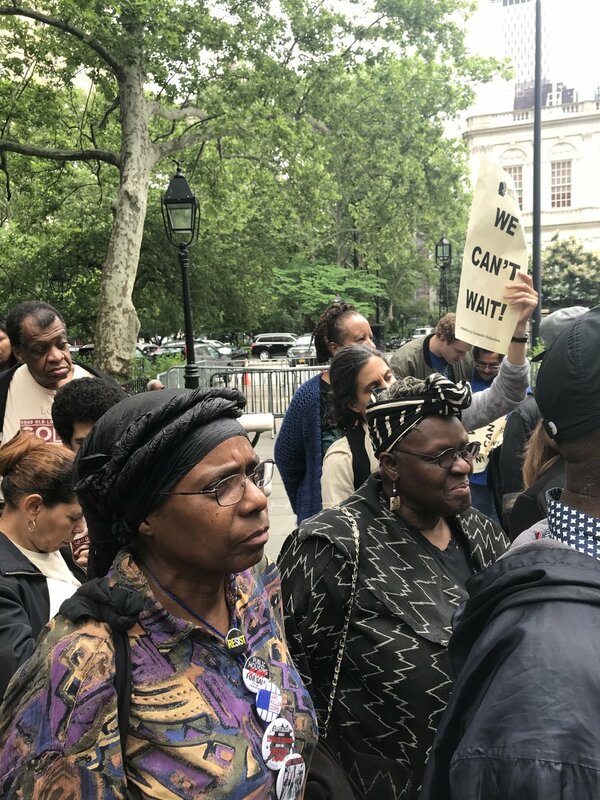 City Hall, NY - Today, members of Community Voices Heard (CVH) stood with Majority Leader Laurie A. Cumbo, and Council Members Diana Ayala, Carlina Rivera, Helen Rosenthal, Ben Kallos, and Alika Ampry-Samuel to call on Mayor de Blasio and NYCHA to deliver a repair timeline of each building, as well as renew their demand for $2 billion to be included in the city budget to expedite the repair process. Standing in front of City Hall, those in attendance reiterated their call on the Mayor to provide $2.45 billion in capital funds this year and $1 billion annually in subsequent years to address ongoing critical needs and invest in housing development on NYCHA land, as proposed in the City Council’s preliminary budget response. However, funding is only half the battle. To ensure that money is allocated and spent appropriately, activists and members also called on NYCHA to produce a repair timeline for every building. The timeline would be considered the first step in attacking the housing crisis by including the scope of work for each building and who would complete the repairs, as well as information on how to expedite the permit process and any other inter-agency obstacles. The drafting of a timeline would also offer an opportunity for NYCHA tenant leaders to be involved in the process and determine whether the allocated funds will be spent appropriately. CVH has consistently called for further tenant participation through a Resident Oversight Council. “NYCHA residents cannot wait any longer for Mayor de Blasio to step up! This year’s boiler failures and the Federal agreement confirms what CVH has been saying all along -- NYCHA requires a significant investment from the City. Allocating $2 billion this year will allow the city to begin making good on its obligations to NYCHA and the City of New York. As Speaker Corey Johnson said, the City definitely has the money,” said Afua Atta-Mensah, Esq., Executive Director, Community Voices Heard. “With this funding demand, we are also asking for a detailed timeline that will ensure the accountability that tenants deserve. NYCHA wastes an infinite amount of time on repairs and being able to fast-track projects is crucial. We will not stand for any excuses. Mayor de Blasio, make our proposal a reality for the hundreds of thousands of residents in NYCHA who rely on your leadership to live healthy, safe lives.